Over ten years ago, after having spent more than 20 years a salesperson, VP sales and sales consultant, we secured our first contract to provide negotiation training for the procurement arm of a major US airline. I felt like the proverbial fox in the hen house! Procurement Organization of The Year! Let the panic set in….clearly these people were good at what they did. How can I, a lifelong salesperson, leader and consultant provide insight? Well, we did it and since that time have worked with many Fortune 100 procurement organizations globally. 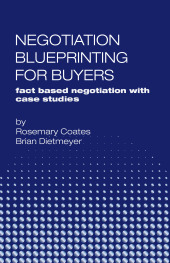 I’ve also had the good fortune to write a negotiation for buyers book with supply chain management expert Rosemary Coates. It turns out that understanding the sales side of the fence provides a good many insights for buying organizations. It seems to us that buyers and sellers are sort of like any relationship, where neither side really understands the other! They are not buying something….they are making a decision. If that is the case (and it is) we need to stop trying to sell them something and start helping them make higher value investment decisions. While professional buyers may focus on price in their dialogue with us, internally, it is a much more complex decision they are making. In fact, when we were doing work for a global energy company in Asia, I arrived one day prior to my session to get over jet lag and sit in on their meetings that day prior. What I observed at their session completely changed my perspective on how purchasing operates. The group was testing new Weighted Attribute Decision Making software. In fact, every organization we work with uses similar tools whether it’s Excel or cloud based. It is this analysis that helps procurement teams and professional buyers make high value decisions ….but they are not finished there. The next step is to evaluate the commercial terms (pricing and services) as well as risk (contract terms) and determine if the terms are in line with solution value. 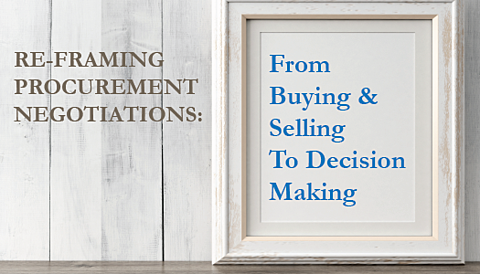 How Can Sellers Help With Decision Making? We’re beginning to see sellers build sourcing guides for their own products and this is a really good idea in our opinion. As sellers, we have the choice to react to pricing demands from procurement or become adept at leading them to make higher value decisions. Suppliers who add value in this area will have a decided edge and move from reactive defense to proactive offense. For more on this subject, read our Speaking the Language of Procurement article. 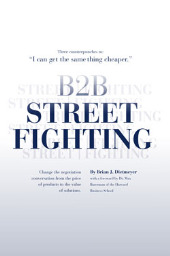 The B2B Street Fighting blog brings you the latest on what's happening in the real world of business negotiation. Whether you are in sales or procurement, we have the books you need to read. © 2017 Think! Inc. | 5600blue All Rights Reserved.